Perfect for the environment - And your wallet! Enjoy eco-friendly solar heated pool water all season long while saving money with the SolarCurve Solar Heater for above ground pools. This unique heater brings the existing concept of solar heating domes to the next level by providing a new, more efficient shape and design that will considerably lower the amount of time it takes to heat your pool while also increasing the heating capacity by 40% per cycle. It features easy, do-it-yourself installation with everything needed to get up and running in minutes. 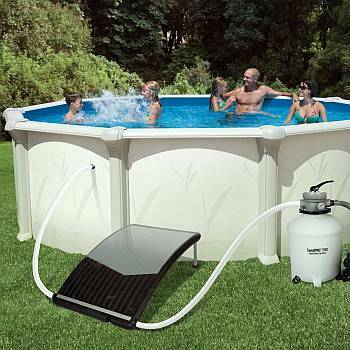 Once connected, your pump-operated filtering system feeds water into the heating station through the solar coils and is warmed by the solar energy collected within causing soothing, warmed water to be pumped back into your pool through the exit port and hose leading to the return fitting inlet. Each SolarCurve comes complete with an adapter for soft sided pools, two installation hoses, and collapsible base legs for easy mobility and adjustment if needed. 1-year limited warranty.